The early anticipation for the 2012 Jordan Brand collection is growing and one of the most anticipated release next year is the returning Air Jordan 11 Low. 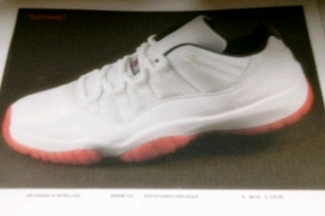 According to reports, the Air Jordan 11 Low will be released early next year in White / Black – Red colourway for $135. No official images have been release, but one blurry image confirmed the anticipated release of one of the well-received model from Jordan Brand. Visit us regularly because we will keep you posted on this one! Air Jordan 11 Low Sneak Peek!